UP Safai Karmi Online Form – Uttar Pradesh Nagar Nigam Recruitment Board has been published notification for UP Safai Karmi Bharti on 40000 vacant post. Online Application Form of UP Safai Karmi is available on the official website उत्तर प्रदेश नगर निगम की वेबसाइट पर उपलब्ध है | वेबसाइट का लिंक नीचे दिया गया है । आप उसे Visit करके अपना UP Safai Karmi Online Form भर सकते हो | UP Safai Karmi Bharti was declared on the June 2016 but due to some official problem it delayed. A huge no. 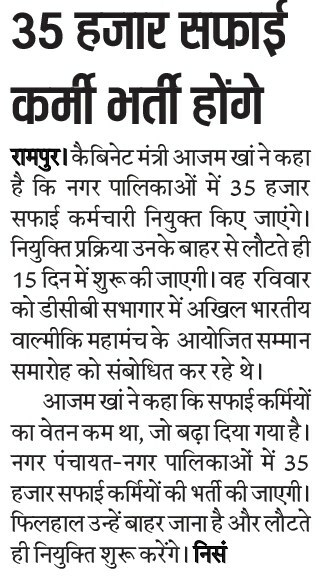 of applicants were waiting for the UP Safai Karmi Recruitment from a long time. Now their wait is over and you can apply UP UP Safai Karmi Online Form 2016 40000 Post at the official website of Uttar Pradesh Nagar Nigam Recruitment Board lmc.up.nic.in. UP govt. 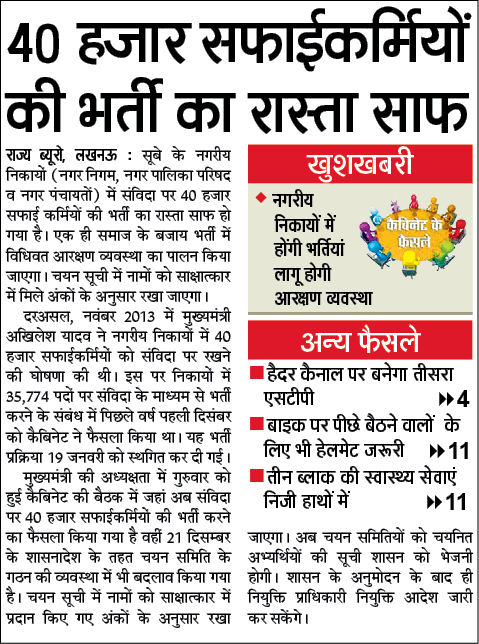 recently released news in the various newspapers for fill the 40000 Safai Karmi vacant posts. भारी संख्या में नौकरी के कारण लगभग 10 लाख लोगों ने उप सफाई कर्मी के लिए आवेदन किया है | UP Safai Karmi Bharti is a huge golden opportunity for the all the aspirants who wanted to get a govt. job. UP Safai Karmi Bharti is the biggest recruitment of this year so that a lot of applicants are going to apply for UP Safai Karmi Bharti 2016. If you are interested to join the govt. job then you must apply for UP Safai Karmi Recruitment 2016. A detailed information district wise post and official website is given below. Your Educational Qualification Should Be: Interested candidate must be 8th class passed from any recognized board. There are no other educational criteria for this recruitment. Selection Procedure: Selection will be on the basis of merit list. Merit list will be decide on the basis of 8th class marks. Mode of Submission of Application form: Applicants may fill form online or offline mode. If any candidates want to apply for UP Safai Karmi Bharti then you must follow given below steps to successfully fill the application form of UP Safai Karmi. 2. Then find a link of “UP Safai Karmi Apply”. 3. Now create an account and fill all the required information. 4. After that upload all necessary documents. 5. Now pay the online application fee of UP Safai Karmi Post. 6. Then take a print out of your application form and keep it carefully. 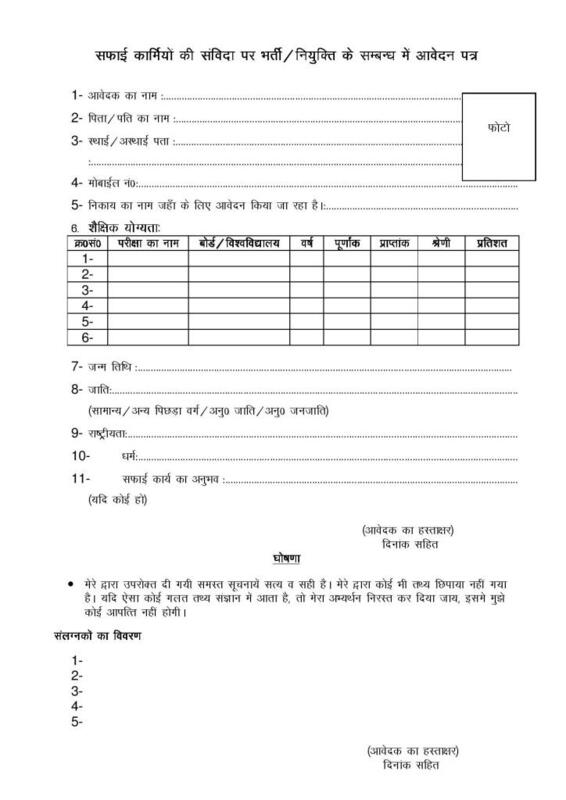 Applicants who want to fill the UP Safai Karmi Application Form then download the printout of the above given Application Form of UP Safai Karmi. And fill all the required information e.g. name, region, address and educational qualification etc. You have to submit the application form through offline mode. If you have any question regarding the UP Safai Karmi Bharti then leave comments below. JOBS NEWS UTTAR PRADESH UP, UP Safai Karmi Merit List, UP Safai Karmi Online Form, UP Safai Karmi Result, Uttar Pradesh 2016, Uttar Pradesh.